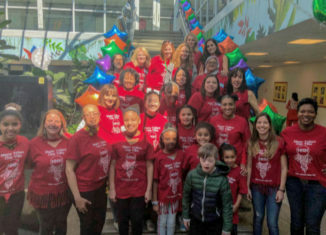 On Sunday, March 24th, the Half Hollow Hills PTA Council, along with the Half Hollow Hills community, united for the 20th annual Unity Fair. The theme this year was “Many Tribes One Vibe.” The exciting day kicked off with opening ceremonies in the West Hollow auditorium. Isabella Negron sang the national anthem, and Dr. Harrigan spoke. The atrium was decorated and there was a Tumi Band, Caricature Drawing, and a Calligraphy Artist. Following the opening ceremonies, different performances took place on the stage. First up was a Chinese Acrobat, Li Liu. Next on stage were performances by the East Side Steppers, the Flamenco Dancers, the Mulvihill Lynch Irish Step Dancers, the High School West Steppers, and the Bollywood Dance Troop. Each of these groups gave it their very best and gave fabulous performances that wowed the crowd. In addition to all of the exciting performances, the cafeteria was transformed into an international food court. Delicious food from all around the world was served for everyone to enjoy. Every individual school’s PTA provided cuisine from a country around the world, such as Haiti, India, and Greece. They also covered different regions around the world such as the West Indies and the Middle East. The gym turned into a cultural celebration as clubs and organizations set up tables around the perimeter of the room. Each table had a craft or activity for the students to enjoy. Some HSE clubs that made an appearance include the Future Educators Club, the Jewish Heritage Club, the Architecture Club, the French Club, the Asian Club, the Indian American Society, and the Interact Club. Other organizations included Reach CYA, the HHH library, the Mother’s Club of Wheatley Heights, and the HSW Women’s Empowerment Initiative. In addition to the performances by district performance groups, the HHH Fencing Team demonstrated a Fencing Bout, the Tony Moon Hawk Langhorn of the Paumanauke Pow-Wow performed a song and dance, the Stony Brook Bhangra Dancers performed, and finally, there was an exhibition of Japanese Taiko Drums. The 2019 Unity Day was a complete success! Participants walked out of the middle school feeling a sense of pride for the district and celebrated the fact that HHH celebrates diversity. Everyone also learned something new about a different culture. A very special thank you goes out to the Diversity Committee for putting together an amazing day!